It’s here, the new Hansel and Gretel slot from NetEnt. You know the rules. If you go down to the woods and find a candy house, you don’t eat the walls and you certainly don’t go inside. But what if NetEnt had swapped out the candy for cash, and kept the witch safely at arms length. Wouldn’t that make more sense? If you’re looking to play slots online for just 10p and with lots of bonuses. Fairytale Legends: Hansel & Gretel has all the breadcrumbs you need to find them. I won’t insult your intelligence, if you’re old enough to play 10p slots up to £200 a spin. Then you know who Hansel and Gretel are. Still, it’s a cool story. But does it make a worthwhile slot game? Hansel & Gretel is the second Fairytale lengends title from Net Entertainment and we like what they’ve done with it. Fairytale Legends: Hansel and Gretel has plenty of bonus treats to tempt slots players! Let’s get to the facts. I want to tell you how much it costs to play Hansel & Gretel for real money. More importantly, how you can win playing it. At 10 pay lines and with 10 bet levels, you can play the slot for just 10p or go balls out at £200 a spin. It’s available on mobile too and comes with a 400 x bet jackpot. As for bonuses, the NetEnt Fairytale Legends bonus machine is in full grind with plenty on offer. If you’re going to win playing Fairytale Legends: Hansel & Gretel, it could happen like this. Symbol matches on 1 of 10 bet lines, Stacked Wild Re-Spins, Random Features, Fairy Wonder Spins, Fairy Suprises or Fairy Wild Spins. Other win factors include the Candy House, Coin Win and Free Spins. Spin the big green button and it does what all slots do, it spins. But 10p slots like this do it much better. Playing the Hansel & Gretel slot is simple whilst the clever graphics and animation keep it enjoyable. I like it how Hansel and Gretel turn and walk towards the reels when they spin, I guess they’re looking for the Candy House bonus. Us too! New online slot games compete with their pay tables, they need to impress players with payout power. In Fairytale Legends: Hansel and Gretel, NetEnt uses some low, medium and high-value bonus symbols to show that power. By the way, this game has payout power. Let’s say you are playing this slot for 10p. In this scenario, the sweet candy symbols can pay up to 40 x 10p = £4.00. Hansel or Gretel will give you 100 x 10p = £10.00 for 5 of a kind whereas the Fairytale Legends logo (jackpot symbol) would pay out 400 x 10p = £40.00 as the slots jackpot. At £200 a spin, a high roller could win £80,000 as the games top payout. Bonus symbols can be more profitable because they trigger the best winning scenarios. Look out for birds eating bread on the trail; it’s a sure bet you’ve hit a stacked wild re-spin with this stretched symbol. Equally important, you’ll need treasure chest symbols to access the more valuable of Hansel and Gretel slot features. Now for the most important part of the slot review, in play features. I’m a big fan of 10p online slots that have plenty going on, Fairytale Legends: Hansel & Gretel meets the mark in this respect. So how can you win? More importantly, how much can you win? I’m going to keep this bit straightforward, helpful and accurate. If counting the features, by that I mean ways you can win other than simply lining up symbols. Hansel and Gretel has six, three random features and three bonus games. The Stacked Wild Re-Spin could be feature number 7, but it’s a weak number 7. However, it can still help you win. The Stacked Wild Re-Spin is a nice to have payout push-up within the base game. If you get a stacked Wild, it stays in position whilst the reels around it move. To keep things simple, it covers ground on the reels and is very good at forming multiple winning combinations. I’m not going to harp on about the random features, 1 they can happen at any time and 2, it’s a fairy that’s involved each time. With names like Fairy Wonder Spin, Fairy Wild Spin and Fairy Suprise, I bet you can guess what happens. Let’s just say you spin the reels, things get all sparkly and a fairy turns up. That’s a good thing, expect wins, big wins and even mega wins from the little shining sprite. The biggest selling point about these random features is that they happen outside of the bonus games. Another way of looking at it, is that they can happen more often than bonus game features. The Hansel and Gretel slot uses three bonus games to help players win the best possible outcome. I say that because it’s playing these games that your best win is likely. Candy House, Free Spins and the Coin Win can be awarded when you find 3 x treasure chest symbols. The Candy House is the main bonus if you like. Makes sense if you think about it, isn’t that what Hansel and Gretel do? Eat Candy Houses? Only this time it’s you, and you’re not eating, you’re winning money. The Candy House game is basically a multiplier gamble game. Pick different sweets, get bigger multipliers, don’t like it, gamble for more multipliers. But it’s a gamble. Choose the average value of the three multipliers chosen, or choose one of the three. The free spins and coin win are the other two high-end bonuses. If you win the free spins, you’ll get 10 free spins. If you win the coin win, you’ll be awarded a 15 x multiplier on your current bet value. Looking at both of these winning factors, I’d say your better with the coin win. But you don’t get that choice. As one of the new 10p slots available to play on mobile, tablet or desktop. NetEnt Hansel & Gretel offers real money betting across 10 bet levels with multiple coin values. The lowest bet as we’ve already mentioned is 10p a spin whilst the highest bet is £200 a spin. 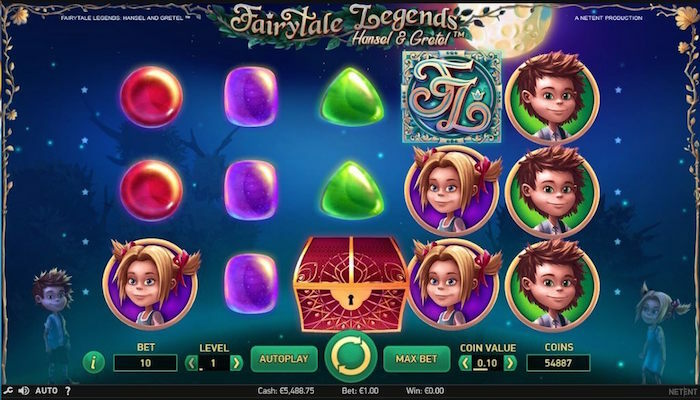 The RTP payout rate for Fairtytale Legends: Hansel & Gretel is 96.71% which is average for NetEnt slots whilst the jackpot is 400 x your betting stake. If playing for 10p, that’s £40.00. If playing for £200, it’s £80,000. The Fairytale Legends slots from NetEnt continue to impress. First it was Little Red Riding Hood, now Hansel and Gretel pick up the breadcrumbs. Whilst looking for slots online you can play for just 10p, we’ve found a Candy House well worth eating. Or should that be spinning.